Franklin Tomorrow held its monthly FrankTalks lecture series on Monday, April 8, with a panel focusing on civility and measures to increase civic engagement at SPARK, Lipscomb’s Idea Center in Cool Springs. Leading the panel was David Plazas, opinion & engagement editor for The Tennessean; Shanna Singh Hughey of Think Tennessee; and Franklin Mayor Ken Moore. 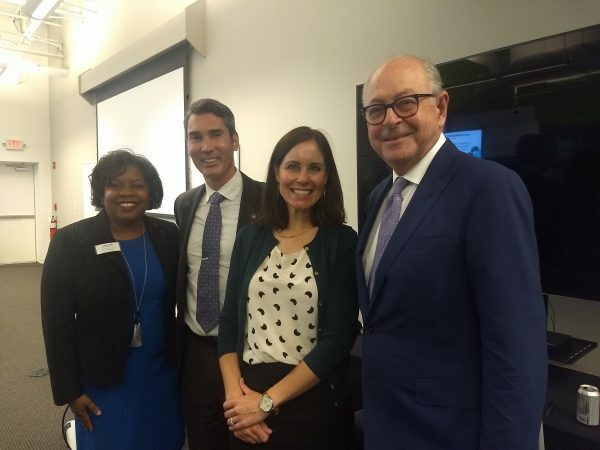 Franklin Tomorrow Board Chair Allena Bell (left) thanks panelists David Plazas, Shanna Singh Hughey, and Franklin Mayor Ken Moore for participating at the April 8, 2019, FrankTalks. In January 2018, under Plazas’ leadership, The Tennessean launched Civility Tennessee, a yearlong campaign to engage the community. Hughey is president of ThinkTennessee, a nonpartisan think tank based in Nashville. In 2018, Franklin Mayor Ken Moore created Unite Williamson in an effort to bring together and connect faith-based organizations for the benefit of everyone in our community. The group held its first inter-faith prayer breakfast in Fall 2018. 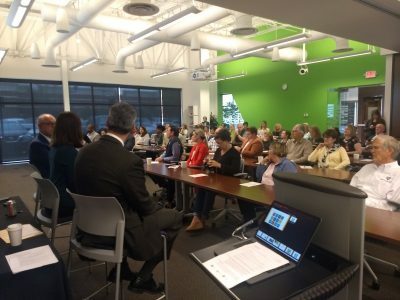 It was a packed house April 8, 2019, at SPARK, Lipscomb’s Idea Center, in Cool Springs for FrankTalks. FrankTalks is presented in cooperation with Williamson Medical Center, a sustaining partner with Franklin Tomorrow, as well as Renasant Bank. To view the presentation, click the link below.